Welcome to Mount Etna, the highest active volcano in Europe. The holiday house "etna Holiday Home" offers a living in the sign of nature, sport and discovery of this unique region. 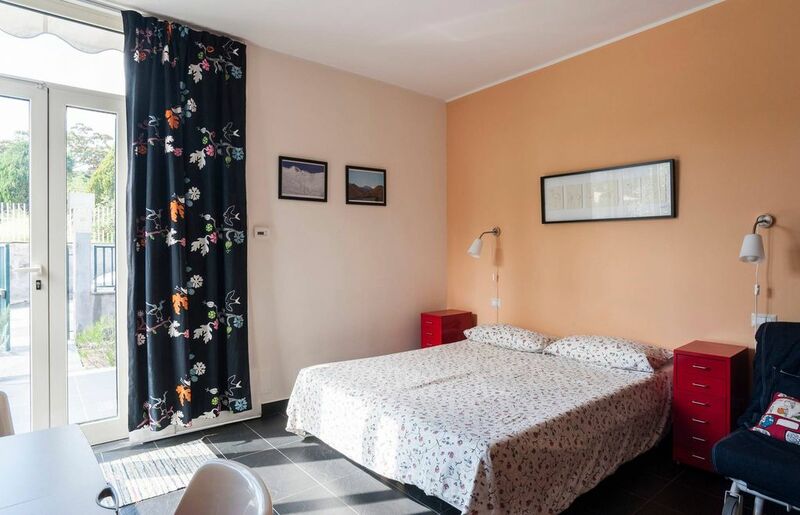 Entirely furnished and equipped with great care for two or three people, Melograno is modern and cheerful, in shades of orange and red , with high quality fittings. We have decorated this studio with the same care and precision that we reserved for our own house. For this reason the apartment is fully equipped, brand new, with kitchen and a spacious bathrooms, private terrace and garden, parking. Inside you will find air conditioning, heating, free internet wi-fi access and Tv, and all the accessories to make your stay comfortable. Outside there are table and chairs for outdoor dining. And if you require something more, you can just ring at the next house, where we live, and we will be happy to help and meet your requests. The neighborhood is quiet and there's little traffic, you can reach by walking fine restaurants and some of the best pizzerias in the region.You'll also find plenty of bars and pastry shops where being enchanted by the wonderful Sicilian pastries. Supermarkets, shops, banks, pharmacy and post office are minutes away. The location of the house is perfect for visiting the Etna and the Ionian coast of Sicily from Taormina to Syracuse, allowing you, in all seasons, a trip to Etna, the highest volcano in Europe, recently nominated by Unesco as World Heritage Site for its uniqueness and natural importance. Arriving in the summer, it will be pleasant to spend a day among the Etnaland waterslides, adventure parks or even nearby Mount Etna. Just a short distance (about fifteen miles) will separe you from the beautiful white sand beaches of Plaja of Catania or the black lava cliffs of Etna. Nicolosi is able to offer much to those who practice the sport, providing hiking lovers beautiful trails inside the Etna Regional Park and, in winter, the slopes of the volcano. Etna is also a popular destination for lovers of ski mountaineering. The house is very close to the "red Mountains", ancient volcanic cones now covered with a pine forest. The "red Mountains" can be reached on foot, and nearby there are riding stables, swimming pool, sports fields and facilities.